Here’s something so simple and perfect you’ll wonder why you never made it before. I started to make this while working at Dixie’s Restaurant in St. Paul. It’s a FABULOUS place to go, and I highly recommend it for the food, atmosphere and service. Oh, yeah, and the beer. They have a great variety. 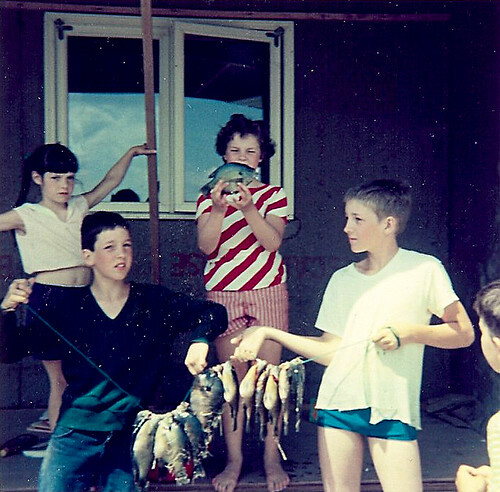 We used to go fishing from time to time when we lived on the farm, and while catfish wasn’t on the menu, we did catch a lot of sunfish. After preparing them, Mom (Patty) would dredge them in flour and fry ‘em up on the top stove. So fresh, the taste still reminds me of summer. We’d also wade in the rocks and catch crawfish. Mom wouldn’t have anything to do with the preparation of those, but we’d put ‘em in a pot of boiling water and happily shell them, dip them in butter and pop ‘em in our mouths. 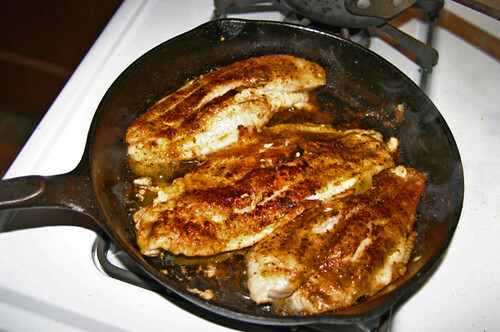 Catfish is generally inexpensive, even fresh. While it’s best fresh, you can also use frozen. I love to serve this as a main course for a dinner party with a side of clarified butter (just as they do at Dixie’s). You can also serve this on top of a salad. The fish stays firm and has a wonderful texture. I often cook it up just for myself, as well. It’s a perfect, “I have to eat something now” dish to prepare. Ten minutes, and you have a healthy entrée. Place olive oil in frying pan (preferably a cast-iron skillet) and heat to medium-high. Place desired amount of seasoning on each side of filets. Place filets in pan, saute approximately 5 minutes per side. Serve. I remember fishing for sunnies with my fancy bamboo fishing pole. Good times….good times! I’m thinking that lovely picture has to be circa 1976, my weren’t we ‘fancy’. What year did the house get built? I see were standing on the siding for it, Fred would know the year! Love the pictures! Yum! Found your amazing blog through foodbuzz & am a new follower! Katy, is that YOU??? That photo is KILLIN’ me! And the recipe looks yummers, too! Yes! I am apparently a very crabby version of Laura Ingalls Wilder.